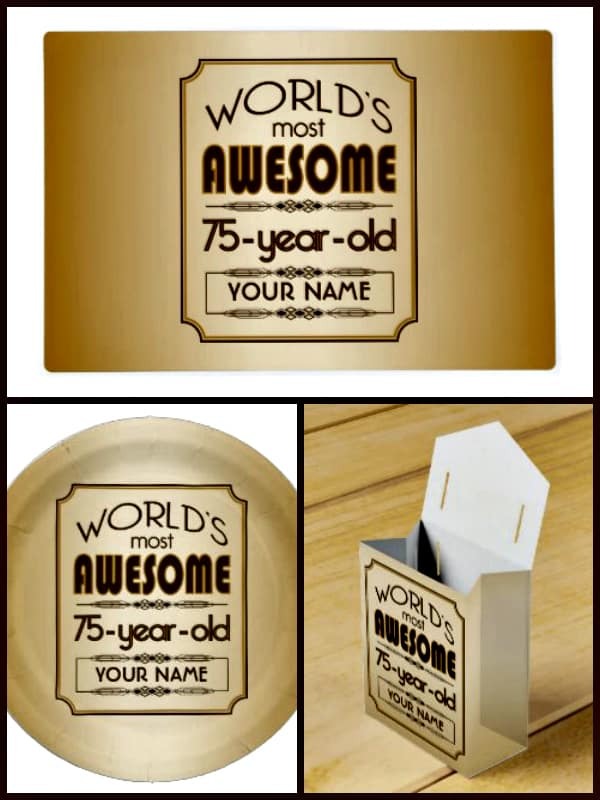 Celebrate the big day in style with these elegant gold and brown World’s Most Awesome 75 Year Old party supplies! Set the tone for the party with matching invitations, starting at under $1.25 each. Your guests will be impressed when they receive the elegant invitations that are personalized with the guest of honor’s name. Set an impressive table at the party with matching plates and napkins. You can buy matching laminated placemats, but you m might prefer to use a solid color tablecloth to accent the theme. You can order a 4″ cake topper to match, or ask your local bakery to match the theme for the cake. Send your guests home smiling with matching sugar cookies, chocolate dipped oreos or brownies wrapped in cellophane bags and tied with a colorful ribbon. Or you can pop a party favor into the coordinating party favor boxes. It’s a fun, positive theme that is guaranteed to make the guest of honor feel amazing!